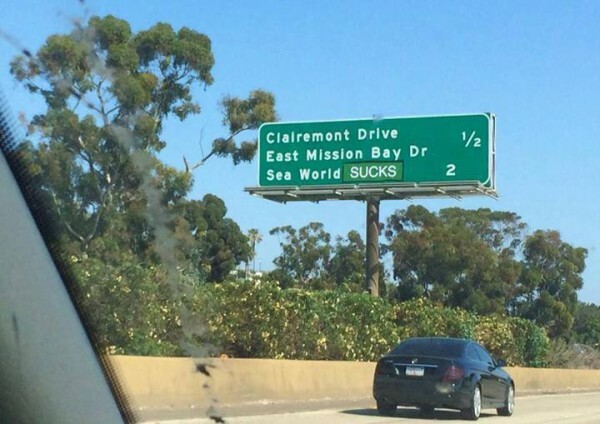 Someone altered this freeway sign on Sunday, May 25, 2014. It has been verified that it is a real alteration, not simply a photo shop product. I have it on good authority it is not a photoshopped image. It is a patch pasted over the freeway sign. Finally, a little truth in advertising!!!!!! Don’t they have anything better to do than to deface our public property? Sea World is part of our community. It has been for decades. Whether you work with Sea World directly or not, they bring a lot of tourist dollars into our local economy. They contribute to our quality of life. People come from all over the world come to San Diego to visit, among other tourist sites, Sea World. They deserve our support. I don’t hear anyone from Sea World claiming they are perfect but I do know they are a world renowned authority on marine biology. When marine life struggles along the Pacific shore, often people turn to Sea World for help. We don’t see legislators or vandals on the beach, we see marine biologists from Sea World. If you see a vandal defacing a sign, whether it’s public property such as a street sign or private property such as a tourist advertisement at the airport, you should report the incident and the individual responsible if possible. Taping a patch over a sign is not defacing it. All you have to do is remove it and it’s good as new. So much graffiti is mindless tagging. Nice to see someone actually trying to say something. People come to San Diego for the weather, the beaches, mountains, and deserts. San Diego doesn’t need SeaWorld to bring in tourist dollars. The traffic SeaWorld generates, the fireworks, and noise all detract from the quality of life in the communities around it. Don’t forget the amount of valium impacted POOP sent directly into Mission Bay. Yeah that’s what I was thinking when I was sitting in rush hour traffic the other day- “all this traffic and noise detracts from my quality of life” so I quit my job and sit around doing nothing all day now. No, you remove it. That way we don’t have to hire employees for CalTrans to police the highways of people’s childish stunts. I think the issue is Sea World’s enslavement of intelligent cetaceans, not Sea World itself. But Sea World has refused to acknowledge its abuse, or take steps to correct it. If I see a person engaged in an act of bravery and social conscience, I may congratulate them, but I certainly would never report them. SeaWorld’s enslavement of orcas is only part of it, they have many other shameful practices – infiltrating opposition groups, pushing their theme park agenda while claiming to be educational, not paying their fair share of infrastructure improvements. There is a long list. SeaWorld has sown some bad seeds for itself that go beyond enslaving orcas, although that is clearly the worst. SeaWorld isn’t even ‘SeaWorld’ it’s just part of a bigger profit machine, formerly owned by beer giant Anheuser-Busch, now owned by Blackstone Group – a financial services mega-corporation. I think their infiltration of opposition groups is part of their cetacean issue, goes along with their lobbying efforts and PR whitewashing. I was unaware of their refusal to pay for infrastructure improvements. Certainly Sea World drive is in desperate need of a complete rebuild starting with its roadbed to eliminate the humps. What’s wrong with a theme park? Can an establishment not be both? And we enjoy the fireworks, although we can tell there are some neighborhood dogs who don’t like them. Blackstone is of course evil, that’s widely known. But I hesitate to blame Sea World for Blackstone’s strategy of seizing all our homes and then renting them back to us while emptying the government’s coffers to cover their own paper losses. The problem with a theme park is that SeaWorld’s leasehold in Mission Bay Park was based on it being an educational institution. There is nothing wrong with a theme park per se, but that’s not what they agreed to. SeaWorld pushed Prop D in the late nineties to get an exemption from the 30-goot coastal height limit, saying they had no plans for roller coasters. One of many lies. Every community around them voted against it but they won a slim victory County-wide. Now they have two roller coasters. SeaWorld is just a piece of Blackstone’s holdings to make money like any other piece. How much of their corporate decision making actually involves concern for animals and how much is purely Blackstone profit motivated? I wonder, do the marine mammals enjoy the fire works? gristmiller – this has been an issue for me for years. Sure, SeaWorld passed the test set up by themselves, the City and a few environmental groups in order for their fireworks to continue. But did anyone ask their sea animals? So, right above, almost nightly during the summer, all their animals are subjected to those explosions. I think if SeaWorld cared about the animals they would take steps to improve the environment for the animals. Fireworks do not have to been so intrusive which can include fireworks and laser shows choreographed to music with nothing louder than a crackle. It’s time for SeaWorld to change!